Editor’s note. Thursday night Sen. Ben Sasse (R-Neb.) took to the Senate floor to call for passage of the Born-Alive Abortion Survivors Protection Act (S. 130). If enacted, the bill would extend federal legal protection to babies who are born alive during an abortion. The bill is more pressing than ever in light of the remarks of the governor of Virginia, which Sen. Sasse discusses at length. Below are his full remarks. Mr. SASSE. Mr. President, this place fancies itself the world’s greatest deliberative body, but we would be deceiving ourselves if we ignored the biggest debate that has been happening in America over the last 36 hours. A publicly elected official—Governor of one of the 50 States—has been defending a practice that is morally repugnant. The Governor of Virginia has been defending a practice that is repugnant to civilized people across the entire world. Here is just one of the ugly nuggets from Ralph Northam, the Governor of Virginia: ‘‘If the mother is in labor . . . the infant would be delivered, the infant would be kept comfortable, the infant would be resuscitated (if that’s what the mother and the family desired) and then a discussion would ensue between the physician and the mother.’’ Let’s be very clear about what we are talking about. We are talking about fourth-trimester abortion or what anyone in the normal world calls infanticide. That is what we are talking about, and the Governor of Virginia has been defending this all day yesterday and again today, going out and trying to equivocate and qualify and then double down and again say he wants to defend this practice, which is infanticide. Let’s be clear about what we are talking about. We are talking about killing a baby who has been born. We are not talking some euphemism. We are not talking about a clump of cells. We are talking about a little baby girl who has been born and is on a table in a hospital or a medical facility, and then a decision or a debate would be had about whether you could kill that little baby. We are talking about the most vulnerable among us, and we have a public official in America out there again and again defending this practice. This is infanticide that we are talking about. This should be so far beyond any political consideration. We are talking about a little baby—a baby with dignity, an image bearer. We are talking about a tiny life that has done nothing wrong to warrant being left to die cold and alone on a table. Everyone in the Senate ought to be able to say unequivocally that killing that little baby is wrong. This doesn’t take any political courage, and if you can’t say that, if there is a Member in this body who can’t say that, there may be lots of work you can do in the world, but you shouldn’t be here. You should get the heck out of any calling in public life where you pretend to care about the most vulnerable among us. There should be no politics here that are right versus left or Republican versus Democrat. This is the most basic thing you could be talking about. We are talking about a little baby born alive, and we have a public official in America defending the idea: Well, you could have a debate about killing her. That is why today I am starting a dual-track legislative process to make sure this body has a clear-eyed look at the issue before us, has a clear-eyed look at this atrocity, and to make sure the 320 million men and women who are actually our bosses—to be sure they have a clear-eyed look at what we stand for. Do we stand with those little, vulnerable babies in desperate need of care and comfort and support, medical treatment, food, or do we stand with the comments of the Governor of Virginia over the last 2 days? Tonight, I am beginning what is known as the rule XIV process. That is an expedited procedure for floor consideration of my legislation, the Born-Alive Abortion Survivors Protection Act. In addition, I want to announce that on Monday night, I am going to be sure that every Senator has the opportunity to come to the floor and say whom we stand for and what we stand against. So I want to announce that in addition to the rule XIV process that I am going to initiate in a moment, I also want Senators to be aware that on Monday evening, I am going to be asking unanimous consent for Senators to come to the floor and pass the Born-Alive Abortion Survivors Protection Act legislation. 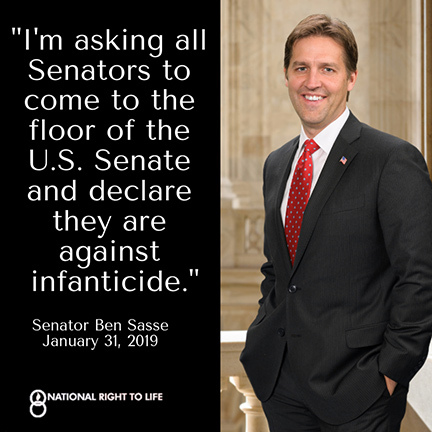 I am going to ask all 100 Senators to come to the floor and be against infanticide. This shouldn’t be complicated.